Chase Phelps joined The Farm in June 2016 as an Applied Sports Scientist for the Department of Athletics. 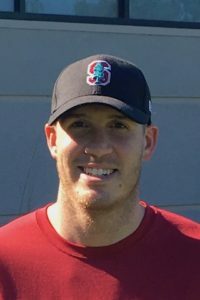 Prior to coming to Stanford, he began his career in the Human Performance field in various intern and assistant strength and conditioning coach roles at Radford University, Old Dominion and IMG Performance Institute respectively. In 2011, he was hired as the Director of Athletic Performance at Hampton University where he oversaw all aspects of their Sports Performance Department. Chase was subsequently hired by a Human Performance Program that worked with U.S. Special Operations Forces, and attributes a large amount of his growth to that unique position. No. 4 Stanford has been selected as the No. 1 seed in the East Lansing Regional. The three-day, 54-hole Regional will take place from May 6–8 at Forest Akers West Golf Club. Freshman Brody Malone has been awarded the final College Gymnastics Association National Gymnast and Rookie of the Week selections of the year. For the fourth time in six years, Stanford captured the Pac-12 Men's Golf Championship, coming from behind on Wednesday at cold and breezy Eugene Country Club. It marks the 11th conference title for the program. No. 3 Stanford continues conference play with a three-game series against Arizona at Sunken Diamond, starting Friday at 6 p.m.
No. 14 Stanford begins postseason play on Thursday, competing in the Pac-12 Men's Tennis Championships at Libbey Park in Ojai, California.